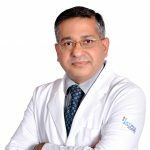 This article is authored by Dr. Sanjay Gupta, who is working as Associate Director at Institute of Orthopaedics & Spine at Jaypee Hospital, Noida. Dr. Gupta completed MS (Orthopaedics) with a gold medal from S.N Medical College, Agra and MCh (Orthopaedics & Joint Replacement) from University of Liverpool, UK. Dr. Gupta has special interests in knee arthroplasty, complex primary and revision TKR, arthroscopic ligament reconstruction and sports medicine. He has performed over 5000 knee replacement surgeries in his 15 years of surgical career. In addition to conventional knee replacement, he is an expert in performing partial knee replacement and minimally invasive knee replacement.